Hurricanes, and wildfires are more frequent, more devastating, or both. In 2017, high-category hurricanes battered the US and wind-whipped fires scorched the West. Deviating from normal tracks, hurricanes even traversed the North Atlantic to create disaster conditions in the British Isles. In spite of meetings, accords, and technological advances, greenhouse-gas emissions are still moving in the wrong direction. The phenomena are ever more clearly interlinked, yet we have done little to address the problem in a meaningful way and, meanwhile, the climate change resources on the EPA website have gone missing. We have seen three years of relatively flat measured emissions that nevertheless have generated record increases in atmospheric concentrations, perhaps as a result of El Nino events, raising questions about the ability to even detect critical changes. And emissions picked up again in 2017 by an estimated 2 percent, according to the Global Carbon Project as growth in industrial pollution in China and India more than offset a slight decline in the US. It’s clear that our efforts at reducing emissions haven’t prevented GHG levels from rising, Having surpassed 400 parts per million, carbon dioxide concentrations in the atmosphere are contributing ever more to temperature increases, and extreme weather events around the world. The World Meteorological Organization declared that 2017 might be “one of the three warmest years on record.” And the average temperature during 2013-2017 is the hottest five-year average recorded. A December study in Nature compared climate models against what’s already happening in the atmosphere and the worst case scenarios are looming as reality. Temperatures could rise nearly 5 °C by the end of the century, 15 percent higher than scenario outlined by the U.N. Intergovernmental Panel on Climate Change. Which means we’ll have to cut emissions even deeper to prevent dangerous levels of warming. Last August, Hurricane Harvey became the first major US hurricane in a dozen years. More than 60 inches of rain displacing thousands, and killing 80. Then Irma and Maria struck the Caribbean and the Southeast and added to the toll of the most active and expensive Atlantic hurricane season ever. The NOAA Arctic report card for 2017 presented the “new normal” for the Arctic with air temperatures rising at double the rate of the globe overall. The warming is reducing sea ice coverage and melting permafrost (and releasing it’s trapped carbon) with unknown effects on long term cycles and the threat of feedback loops as reflective snow and ice become heat-absorbing dark water. Declining Arctic sea ice may contribute to drought and amplify cold spells. 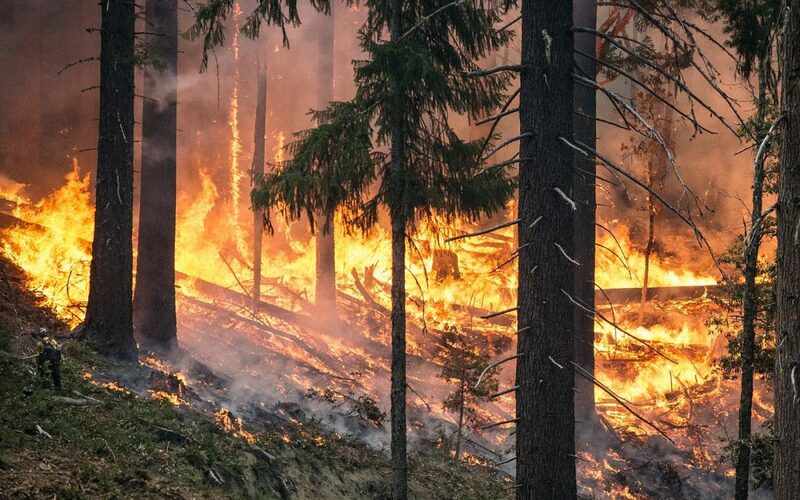 Flames swept across millions of acres in the American West, for the most expensive fire season on record. The rising temperatures and reduced rain have turned the region into a tinderbox. And those same effects have both killed trees and increased insect damage. The result is a massive amount of fuel for future disasters. The National Oceanographic and Atmospheric Administration considers 2017 to be the second most extreme year, weather-wise, in the past century. 2017 was very likely the most expensive weather year ever, with impact estimates of $70 to over $100 billion.